Gone are the days of clunky, piecemeal solar systems. Every part of the SunPower Equinox™ is designed and engineered by one company to work better together—delivering more power, reliability and style than a conventional home solar system and backed by the industry’s best complete-system warranty. At the heart of every system is the Maxeon® solar cell, designed with a solid copper foundation to stand up to harsh conditions and deliver decades of productivity. The unique light-trapping surface grabs more power. The ultra pure silicon delivers optimal power conversion. SunPower’s rooftop, ground, carport and battery storage systems provide you with greater choice, better design, and more value on your path to achieving your clean energy future. Our solar panels for your home have built-in microinverters hidden behind each panel to optimize power conversion at the source-minimizing disruptions and eliminating the need for ugly external inverters. Our proprietary Invisimount® frame is designed to be completely hidden, producing a sleek look that complements any architectural style. This system will look great on your roof. SunPower Monitoring provides a 24/7 in-depth look at your systems performance, allowing you to analyze the value of your investment. 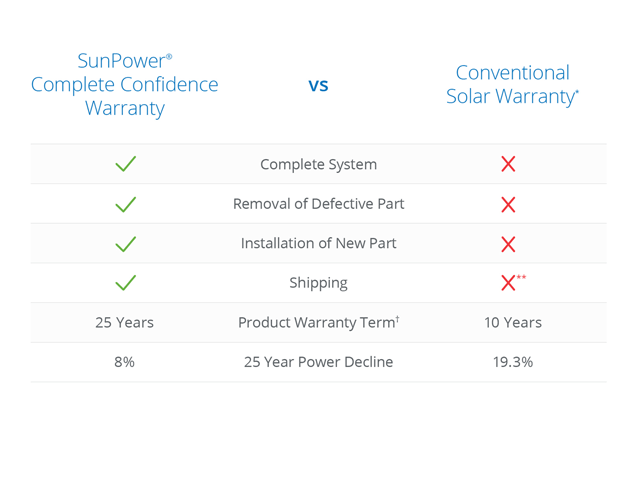 The only solar warranty to cover your complete system for 25 years including performance, product, labor and shipping. We have absolute confidence in our panels’ ability to deliver more energy, reliability and savings over time.